In order to pay for expenses in the New World, such as the French and Indian War, Great Britain began imposing high taxes on the colonists, starting with the Stamp Act of 1765. Such taxes led to a growing resistance in Boston, led by Samual Adams and the Sons of Liberty. Patriots met under the “Tree of Liberty” to discuss their actions of opposing these growing acts of oppression against the colonists. (see Tree of Liberty) Their resistance succeeded on March 17, 1766, when Parliament repealed the Act with news reaching New York on March 20. 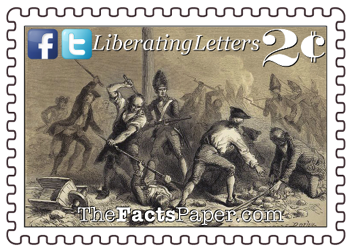 The following day, in celebration of the abolishment of the Stamp Act, along with the king’s birthday on June 4, citizens of New York erected a Liberty Pole in what was known as “The Fields”. Celebrating their victory, but also showing their loyalty to Britain and the Crown, they inscribed the pole with the words, “King, Pitt, and Liberty,” including Prime Minister William Pitt of which Fort Pitt (Pittsburgh, Pennsylvania) was named in their tribute. During the night of August 10, soldiers from the nearby barracks cut the pole down. As citizens assembled the next day to erect another pole, soldiers physically attacked the Patriots. Several Sons of Liberty members, including leaders Isaac Sears and John Berrien, were severely wounded, yet the British officers ignored the citizens’ complaints. Shortly after, another pole was assembled, only to be cut down again a few days later on September 23. Recognizing trouble brewing in the patriots, Governor Henry Moore ordered the soldiers to stand down when the colonists erected a third pole two days later. His orders brought the animosity to a low simmer, though some contended the first two pole destructions were actually instructed by Moore himself. Colonists and Red Coats managed an uneasy peace until the one year anniversary of the Stamp Act repeal. Citizens once again gathered around the Liberty Pole on The Fields, also called “The Commons,” on March 18 to celebrate. This bold act once again triggered the anger of the British soldiers, to which several responded by cutting down the pole. Tired of the game, the Sons of Liberty raised a forth pole the next day. This time they added iron bands to the lower portion of the pole to protect it from saw blades. In addition, a guard was placed at the pole. Such lengths did little to dissuade the soldiers who promptly tried to destroy it, even using gun powder in attempts to blow it up. Yet their every effort was thwarted by the Sons of Liberty. After several nights of such attacks, the governor once again stepped in and ordered the Red Coats to stand down. The colonists viewed the Assembly’s capitulation as a surrender of their rights, including being taxed without any representation in Parliament. Crowds met daily on The Commons under the Liberty Pole to protest the new regulations. The British soldiers, on the other had, were offended that these British subjects were not willing to properly pay for their services. Demonstrations at the pole only enraged the soldiers even more. While citizens congregated at Montagne’s Tavern to discuss what to do, the 16th Regiment finalized their plans to destroy the Liberty Pole once and for all. The iron guard made it impossible to cut down, so they resolved to drill a hole into the pole, insert gun powder, and then blow it over. Soldiers were strategically placed on streets throughout the city on January 13, 1770, to intercept any citizens that might come along to disrupt their activities. Observing the soldiers, a passerby immediately entered the tavern and reported what he witnessed. The building emptied as the Patriots crossed the street and descended on The Commons yelling, “Fire” to attract attention. Quickly, the fuse in the pole was lit but it fizzled out. Unable to allow a victory for the people, the soldiers stormed Montagne’s Tavern with their swords and bayonets drawn. Like madmen, they ransacked the place and beat up a waiter, invoking chaos until officers commanded their men back to order. Unsuccessful attacks continued until three days later, at midnight, a group of soldiers snuck out to the pole and finished the job. Successfully igniting the powder, the men chopped the tumbled pole into pieces before depositing it in front of Montagne’s Tavern. Upon its discovery in the dead of night of January 17, the bell at St. George’s Chapel rang, prompting 3,000 citizens to arrive the next morning and view the destruction. The Sons of Liberty responded with two declarations. First, no soldier would be hired for work in the city. Being poorly paid, many relied on the additional funds from extra jobs the colonists would now deny them. Second, any soldier found armed after dark and not on duty would be considered a criminal. Since no organized police force existed at the time, citizens assisted the Sheriff, including making arrests. Fearing their own safety, the citizens were setting a policy to defend themselves. Feeling confident, several soldiers started posting handbills on January 19 claiming the Sons of Liberty were the “real enemies of society” and “thought their freedom depended on a piece of wood.” Having enough, Sears and several others grabbed two of the Red Coats as the rest managed to escape. The colonists dragged the soldiers to the Mayor’s house, accusing the men of libel and demanding justice. Before long, a few soldiers returned with 20 others ready to fight with their swords drawn and bayonets fixed and determined to rescue their friends. The Patriots and the two soldiers in custody both pleaded with the Red Coats to return to their barracks and let the Mayor resolve the issue, yet they refused to move until the Mayor ordered them to go himself. Meanwhile, a small number of citizens armed themselves with sticks and clubs fearful the soldiers would attack the colonists again. As the Red Coats made their way back to the barracks, the colonists followed behind to watch them. Upon approaching Golden Hill, another sizable group of soldiers arrived on the scene. With a larger army behind them, they turned to the citizens as they received the command, “Soldiers draw your bayonets and cut your way through them.” They immediately attacked the colonists. Most of the colonists were unarmed except for the handful armed with clubs and sticks. This didn’t stop the soldiers as they slashed and cut at them all. As Francis Fields entered his doorway to investigate the commotion, a cutlass sliced his cheek. A sailor tried to defend himself as his head and finger were cut. A bayonet pierced another not even involved in the crowd, threatening his life. Two soldiers followed a boy into a house, cutting him on the head and attacking a woman who followed in after. Capt. Richardson, who helped prevent the soldiers from entering the Mayor’s house, fought for his life with a stick and would have lost it had not a halbert weapon been given to him. As the mayhem continued, several city officials rushed to Golden Hill. Upon their arrival, they dispersed the soldiers. The riot was over for the night, however the next day a soldier attempted to stab a woman returning from market. Fortunately, the bayonet just pierced her cloak and clothes. Another battle broke out between soldiers and sailors, yet the soldiers quickly returned to their barracks after noticing a large group of citizens heading their way. Despite the violence, no deaths resulted from the Battle of Golden Hill. Since it is the first known confrontation between the British and the colonists that resulted in bloodshed, it has been referred to as the “First Blood” of the American Revolution. A month later, 10-year-old Christopher Snider (or Seider) was shot by a loyalist merchant in Boston, setting in motion the events leading to the Boston Massacre on March 5. (see Mayhem And Massacres) Though the massacre occurred in one evening while the events of the Battle of Golden Hill occurred over a week, the five deaths at Boston and subsequent trials thereafter earned it a page in the history books while New York’s incident quietly faded away after initially dominating the news throughout the colonies. The Sons of Liberty wanted to raise a fifth Liberty Pole on The Commons by were denied by the Mayor. Therefore, Sears donated a piece of private property located nearby where they erected an 80 feet tall pole, covered with metal bands except for the top third of the pole. This pole, which lasted until 1776, was inscribed simply with "Liberty and Property." Liberty, when the Tea Party formed in 2010, the IRS under the Obama administration went after groups trying to organize in protest to his socialist agenda. Media painted them as anarchists, radicals, and even terrorists. (see Tyrants And Tea Parties) Members were labeled racist, even if they were black. Such labels caused the people to grow increasingly angry because they were being dismissed and not being heard. As a result, this group strongly got behind a man in 2016 who stood up to the government bullies, in both parties, and promised to fight for the liberties of the people. We tend to characterize the American Revolution as the Americans against the British. The Patriots against the Red Coats. However, the Patriots were still British subjects, at least until the Declaration of Independence. (see Happy Independence Day) In reality, the battle they fought is more accurately described as combatting a government against the people. We are no different today. Loyalists, or Torries, that supported the crown are today's modern Progressives. They don't mind the big government or the elitist status as long as they are taken care of. (see Everything Free But Speech) Yet there is a group of people who still cherish the freedom and liberty we won in 1783. They want the government out of their lives and out of their business, but most importantly, they want someone to listen to their pleas. With the blessing of the last administration, Black Lives Matter and Antifa started bullying and terrorizing average citizens. (see There’s Nothing Right About The Alt-Right) Democrat leaders escalated the attacks, justifying their actions because they were against the horrors of Republican President Donald Trump and his supporters. In reality, they hate him because he is fighting for the Patriots and against the establishment. They despise his voters for standing up against their elitist crown. (see Communism’s Rise) This is no different than British officials using Red Coats to intimidate the colonists. So almost 250 years later, progressives resent middle America, considering them traitors for protesting the government. Meanwhile, “We The People” view liberalism/progressivism/democratic socialism as an increasingly tyrannical presence.